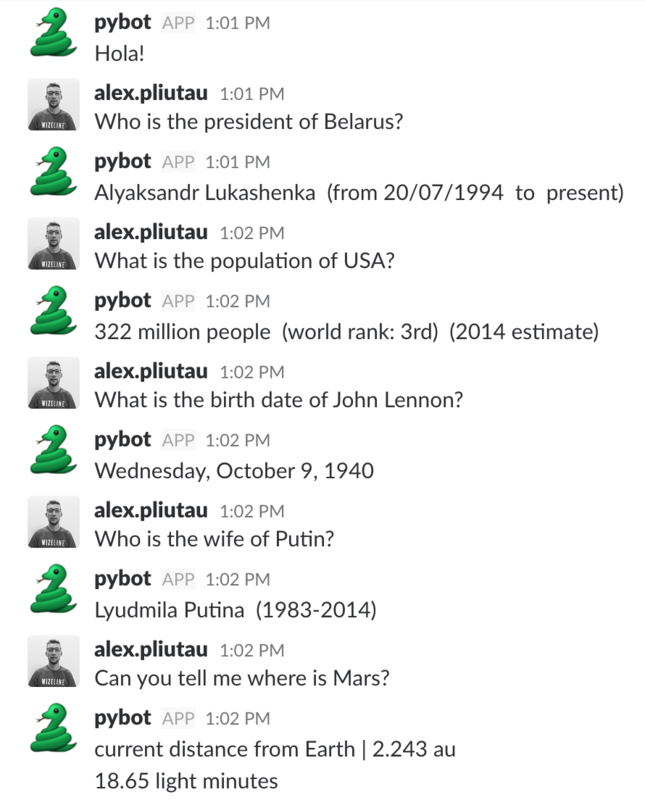 At Wizeline we have Python courses, and recent topic was how to build a Bot in Python. I always wanted to try Natural Language Understanding (NLU) as a subtopic of natural language processing in artificial intelligence that deals with machine reading comprehension. The simple idea is to build a Bot which will answer (ideally) any question. See screenshot above how it works now. You can use rasa-nlu-trainer to define some examples, which we will use later to train the Bot. Then you can save configuration as JSON file. This project requires few dependencies to be installed to build this idea: rasa, slackclient, sklearn, and wolfram/wikipedia to find answers. I used Python 3, you can try to check it with this Dockerfile. I use Slack to communicate with the bot, but I’am pretty sure it can be replaced with any other messaging service. To work with Slack we need to create a bot and get Slack API token. Do you know what is Wolfram? Actually, very nice tool to get concise answers. So we can create a free app there with 2000req/month limit and get App ID. In case request to Wolfram is failed, or it can’t find any answer, we will use free Wikipedia API to get the answer. You can call rasa NLU directly from your python script. To do so, you need to instantiate an interpreter. What is the birth date of John Lennon? Now we just need to send it back to user. Of course prediction currently is very basic, doesn’t handle context, etc. But we can train RASA on the fly. What I want to do next is to save all unparsed questions, or questions Bot for which couldn’t find an answer, and train Bot to answer those questions. So if you are interested in this, I am open for contributions in this GitHub repo.